I know some people have their links on their signatures, but maybe we can all post our links in one discussion? I would love to read/follow your blogs/twitters/etc! There was a post a while ago about Shiba Blogs, before I joined. Do you have one? I find it more fun to blog about Conker than to update my facebook thing. not mine, but someone sent me this once! mika's blog is now combined with mine, all her old posts at her old blogspot is all on my new blog. 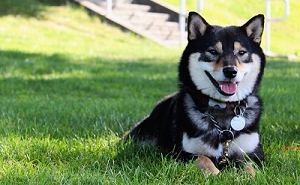 There are a ton of off-forum Shiba blogs, too many for me to name them all. Gina draws comics that are spot on for capturing quirky Shiba behavior. haha, i love her comics! I've been blogging about our dog MoMo since we got her last January. I knew there was a thread like this around somewhere, and just found it again. Thanks for the links to everyone's Shiba sites! I'm trying to get a lot of these linked to my blog--it's a work in progress! If for some reason you prefer not to have your blog linked, let me know (write on my wall?) and I'll unlink it! Decided to start a blog for Toki. http://sweeta-n-g-e-l.livejournal.com/. But it only has one post so far, since I started it last night/this morning. I started a blog for myself a while ago, but now that Minion is a part of our lives, it's going to become very Shiba-centric. My plan is to take a photo of her at least once a week so that we can document her growing up. Here's mine didn't update it like I wanted to. made a post on it though hope to keep it more updated and load some pictures of Saya as a puppy to two years old on her birthday. Yay I'm so glad I found this thread, what an excellent idea! I already posted Conker's blog up top but I recently got one of those twitter things. i love seeing everyone's blogs! I haven't managed to make them links in my signature. I just put up my signature last Friday, but both my tumblr blog and my new twitter account for my puppy are listed. If I haven't started following your tumblr blog yet, I will now. Be prepared for lots of "likes" coming your way! I gotta admit... I don't understand tumblr. But since so many of you seem to be on there, don't forget to add this one to your list! Although I do love all the fuckyeah[thing] tumblrs. There's one for everything, it seems! Bump for new members and new blogs. Some of these links need to be updated! I update at least once a week with new pictures since he's going through so many changes. Also random updates about being a Shiba mom haha. http://kobiyashi.blogspot.com/ please read/follow as my wife blogs about our little one. Bump for new members and more, more, MOARRR new Shiba blogs! Awesome! Now my tumblr is gonna be flooded with even more shibas than normally. genji and yumi are on instagram and PICK!